While the Atlantic Hurricane Season remains quiet the Pacific Hurricane Season has been alive and active the past few months. Only a few short weeks ago Hawaii was keeping a close eye on Major Hurricane Hector which passed just to the south of the island chain. Hawaii may be located in a tropical paradise but it rarely sees hurricane activity. Most of the time hurricanes will make a close approach to the islands delivering rain, large swells, rip currents, and some gusty winds, but it is rare for the islands to receive a direct and devastating hit. 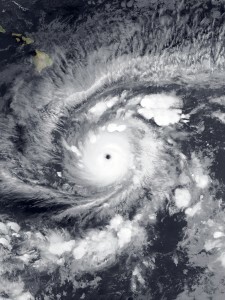 Hurricane Iniki was the last major hurricane to directly impact the island of Kauai back in 1992 as a Category 4 on the Saffir-Simpson Hurricane Scale (fun fact: the movie Jurassic Park features some video footage of Iniki as it passed over the island where the movie was being filmed at the time). Hurricane Hector spared the islands only delivering some rain showers and high surf but now the islands are keeping a close eye on a new threat: Hurricane Lane. 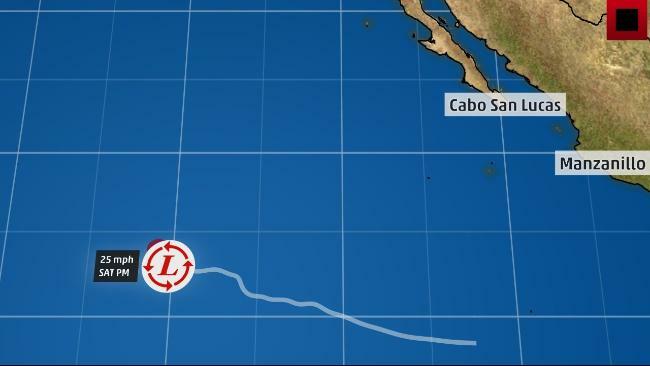 Lane started off as a tropical wave off the coast of Baja California on August 15 and quickly intensified into a Tropical Storm on August 17. Due to minimal wind shear and favorable sea surface temperatures Lane underwent rapid intensification on the same day and evolved into a major Category 3 hurricane by August 18. Currently Lane is maintaining an impressive Category 4 strength and is the fourth major hurricane of the East Pacific Hurricane Season (Central Pacific Hurricane Center, 2018). Maui Counties on Thursday and Thursday night. 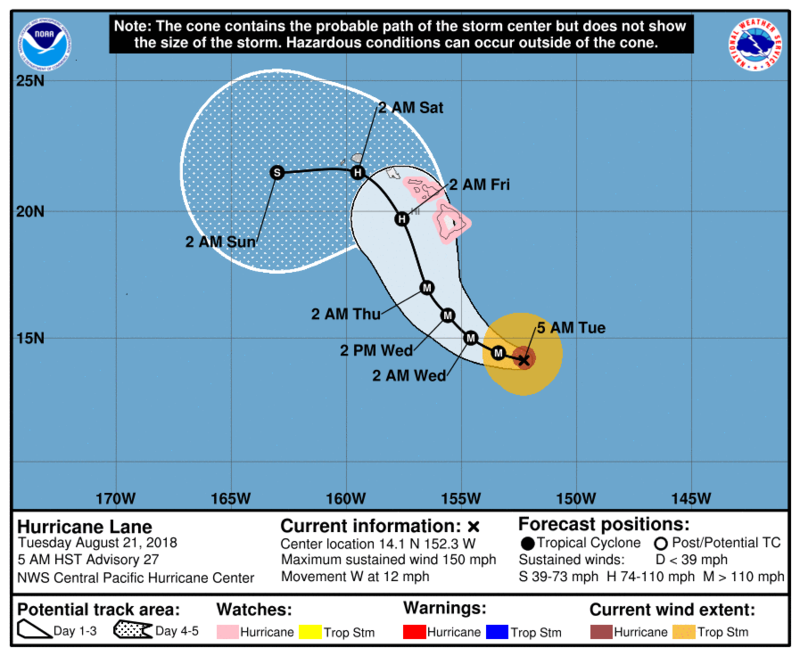 Lane’s center is still relatively far offshore of Hawaii, located about 450 miles (725 km) south-southeast of Kailua-Kona, Hawaii. Maximum sustained winds are currently maintaining 155 mph (250 km/hr). What is impressive about Lane is the size of the system. Even though the center is still far to the south the outerbands of Lane are approaching the Big Island of Hawaii and could bring some scattered showers to the island throughout the day today. Tropical storm force winds currently extend outward up to 140 miles (220 km) from the eye of Lane and hurricane-force winds are extending up to 40 miles (65 km) from the center (Central Pacific Hurricane Center, 2018). This is a large storm, and regardless of where Lane will travel it will bring impacts to the islands especially as the storm inches closer this week. The storm is expected to weaken some as it enters an area with stronger wind shear between Wednesday to Thursday but is still likely to be at hurricane strength. A tropical storm requires sea surface temperatures of approximately 26.5 degrees celsius in order to grow and maintain intensity; and the waters around the island chain are prime for hurricane activity. Therefore, while the wind shear levels may be unfavorable to Lane, the sea surface temperatures will help to keep Lane a powerful hurricane for a few days longer before it completely dissipates. 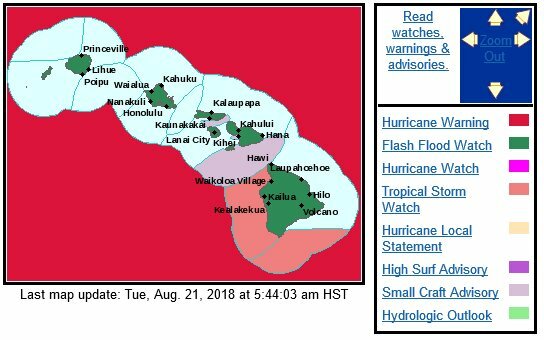 The Pacific Hurricane Center has issued Hurricane Watches to the Big Island and extended the zone to the island of Maui today. As the day goes on the island of Oahu could be in this watch area along with Kauai soon after. Conditions will begin to deteriorate Wednesday into Thursday for the eastern Hawaiian Islands but by late Thursday and Friday Oahu and Kauai need to pay close attention to Lane; Kauai especially. Since record keeping began only two hurricanes have made landfall on any of the Hawaiian islands: Hurricane Dot (1959) and Hurricane Iniki (1992), both of which came ashore in Kauai. This island is the active “hurricane prone” island with regards to recorded direct hits and so far meteorological models are showing Lane making a close pass to Kauai. 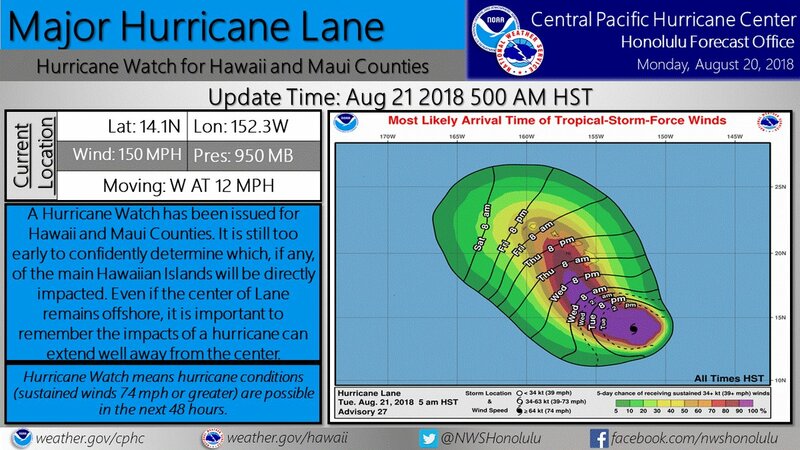 More information will be available as Lane begins to turn northward over the next 24 hours but for now all of Hawaii is on alert for this storm. Surf advisories are in place along the southern coastlines of the islands where large waves are expected to form over the next several days as well as strong rip currents. The surfer populations may be excited for this news but this is hazardous for any swimmer no matter how strong they are. Meteorologists and emergency personnel are encouraging beach goers to avoid the waters over the next few days. Paradise is under threat and residents and visitors to the Hawaiian Islands should continue to monitor the storm over the next few days. Follow orders from emergency personnel and make sure you are prepared for this rare storm in the event it tracks close to the islands. More information will be available as Lane shifts northward. Follow @weather_goddess and the @NWSHonolulu for all the latest advisories, warnings, and information on Hurricane Lane over the next few days. May 15! It’s that time of year again when water temperatures become prime and wind shear levels begin to decrease. It is the official opening of the East Pacific Hurricane season! Many of us probably do not pay too much attention to this region of the world and the hurricanes that are born. Most of the time the storms that do form stay out to sea and travel on a typical WNW track over the open ocean. However, those who live along Central America’s west coast and particularly in Baja California monitor these storms very closely throughout the Hurricane Season. This basin gave birth to notable storms, one being Hurricane Odile (2014), which became the most intense tropical cyclone to make landfall in Baja California in the satellite era. 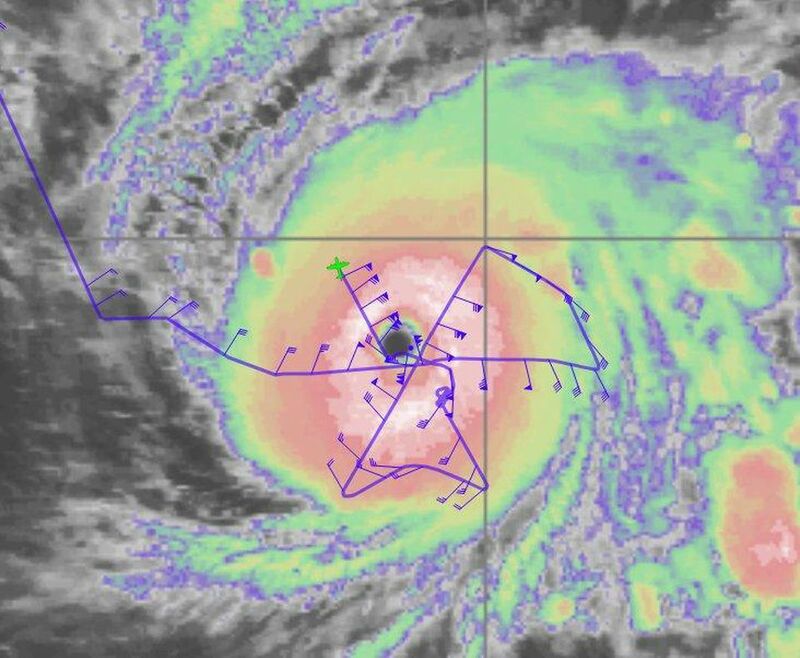 This dangerous Category 4 hurricane with winds of 140 mph (220 km/h) was a particularly hard storm to forecast for many meteorologists. Once the warnings were issued locals and tourists were only given a few short hours to prepare and evacuate. Also, who can forget Hurricane Patricia (2013)? Patricia went on to become the second-most intense tropical cyclone on record worldwide, right behind Typhoon Tip (1979), with a minimum barometric pressure of 872 mb. “Luckily” Patricia weakened before making landfall near Cuixmala, Mexico in a generally rural area, yet it was still the most intense Pacific hurricane on record to strike Mexico. The east Pacific basin has produced strong and catastrophic storms for years and will continue to do so, but the question now is how active will the 2018 season be for this basin? We are already off to a potentially busy start with the first Tropical Depression forming late last week: Tropical Depression One-E.
Track of Tropical Depression One-E taken on May 12, 2018 (Courtesy of Weather Underground). 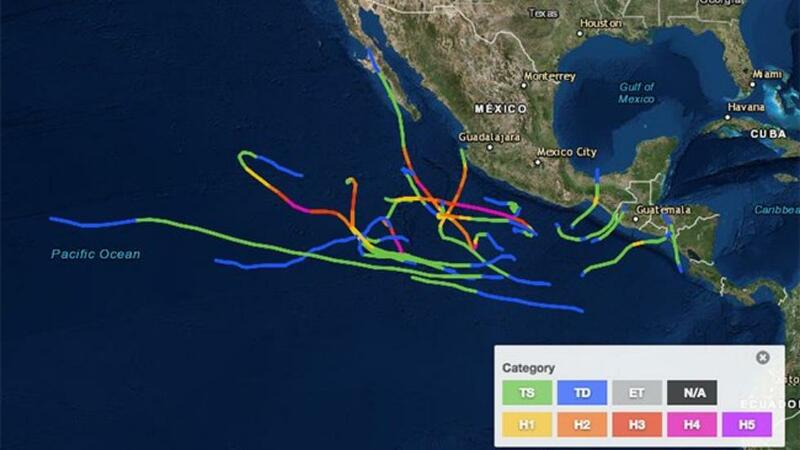 Track and intensity of named tropical systems for the month of May. Data compiled from 2000 to 2016 (Courtesy of Weather Underground). The frequency and intensity of East Pacific storms do not really start to ramp up until mid June, but it could be a quiet start to this ocean basin because of a lingering La Niña event. A La Niña helps to suppress tropical storm formation in the Pacific because of the effects it has on the sea surface temperatures. May 14, 2018 current global sea surface temperatures (Courtesy of Weather Underground). While there is no solid scientific explanation as to why this phenomenon occurs (El Niño Southern Oscillation – ENSO) it does affect weather patterns worldwide depending on if there is an El Niño event (warm phase) or a La Niña event (cold phase). Relating to the image above, take a look off the west coast of South America by Ecuador and Peru and you will see a swirl of temperatures around 22 – 26° C (depicted as orange) that extends westward towards the central Pacific. This is the location of an ENSO event. During La Niña events this area is cooler than the surrounding Pacific waters (what we are currently experiencing). An El Niño event will show the reverse, where the waters will be warmer than the surrounding area. We are currently in a La Niña event and have been for about two years now. However, it is showing signs of weakening steadily with forecasters predicting a switch to an El Niño event by autumn. If these forecasts are correct the East Pacific could see a sudden spike in hurricane activity right during the peak of the hurricane season (September – October). Therefore, while it might be a quiet start to the season over the summer months it may pick up in the later months. This ocean basin may be less active during a La Niña event but this cold phase has the opposite effect in the North Atlantic Basin. The Atlantic during a La Niña event experiences higher than normal sea surface temperatures on average, and therefore it will see an increase in hurricane activity with the possibility of more major hurricanes (Category 3 and higher) being produced. This event is linked to the 2017 Atlantic Hurricane Season and why it was so active both in terms of cyclone frequency as well as intensity. The East Pacific, on the other hand, as well as the whole Pacific basin in general saw less hurricane activity for the 2017 year. First image shows the total number and track of hurricanes for the 2017 Atlantic Hurricane Season. This season was known as a hyperactive season with 17 named storms; 6 which were designated “major” (Category 3 or higher). 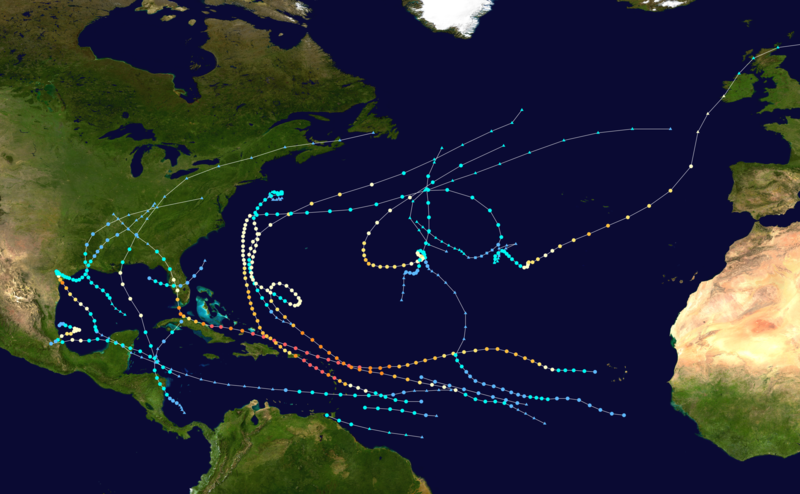 This year also ended the decade long hurricane drought. Since 2005 the continental United States has avoided a direct hit by a major hurricane. In addition, the state of Florida had not been directly impacted by a hurricane since 2005. 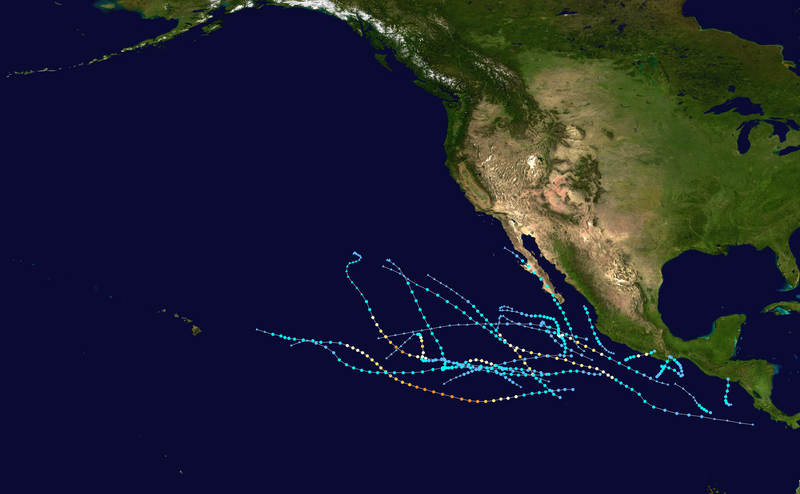 The second figure depicts the hurricanes for 2017 in the East Pacific basin and was labeled to be a moderately active season with 18 named storms, and 4 major hurricanes – most of these being weak and short lived storms. However, it was a season that was significantly less active than the previous three seasons. The final image above shows the number of hurricanes (typhoons) formed in the 2017 West Pacific typhoon season. 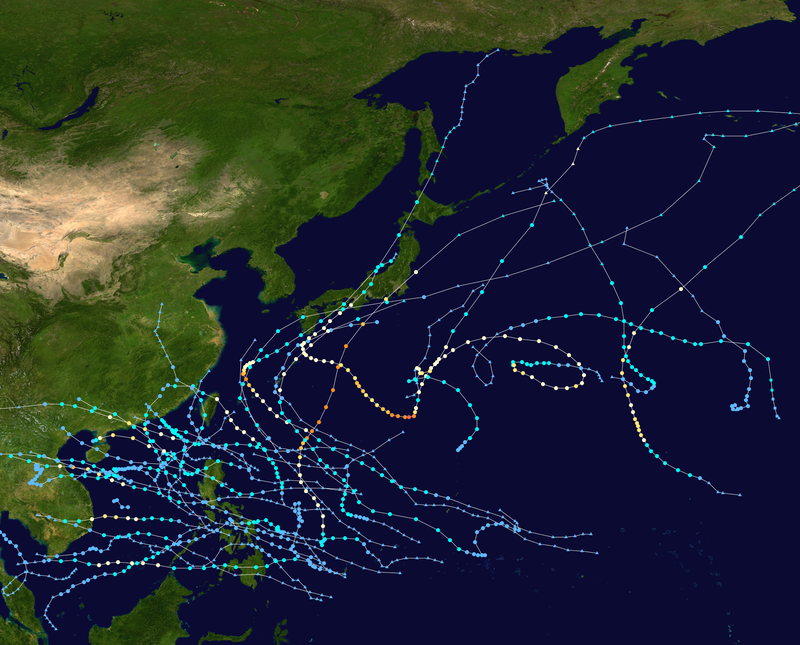 The image may seem like there were many storms that formed, but believe it or not this season was labeled as a below-average season with 27 names storms, 11 typhoons, and 2 super typhoons. Looking ahead to the 2018 Hurricane Season for the East Pacific: forecasters are already warning for a potentially active season, particularly later on into autumn. 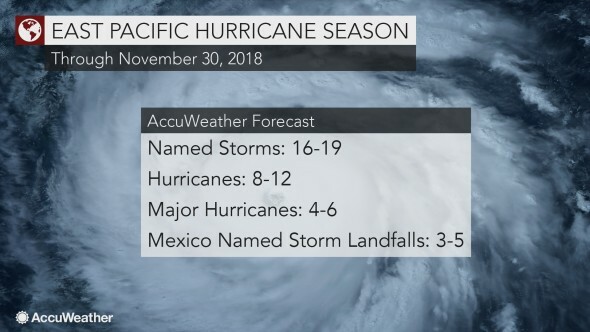 AccuWeather forecast calls for 16 – 19 named storms with about 4 – 6 of these becoming major hurricanes of Category 3 strength or higher on the Saffir-Simpson Hurricane Wind Scale. Tropical Depression One-E may have been an indication of what is to come for this hurricane season. Storm frequency and intensity will likely be on the rise as we enter into the summer months but with the potential of a La Niña transforming into an El Niño event we could see a substantial increase later in the hurricane season with activity slowly dying in the North Atlantic basin during the autumn months but increasing in the Pacific. However, it is important to always be prepared. Last hurricane season forecasts were calling for an El Niño event to quickly form when in fact the La Niña event kept lingering throughout 2017 making it a particular deadly year for the Atlantic. The issue is that meteorologists, climatologists and forecasters do not know very much about the ENSO phenomenon and can make only educated guesses based off climatological almanac data on when a transition may occur. Regardless, the East Pacific Basin is prime for hurricane activity and it will only increase as we enter the summer months and sea surface temperatures begin to rise. Now is the time to prepare because there will always be another hurricane forming on the horizon.